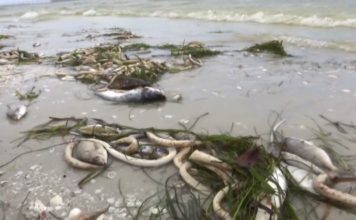 Red tide: you can smell it, and see its deadly impact, but what makes some summers worse than others? “The water here are used to be clear there used to be sea grass there is a boyster now it’s far from that,” said Daniel Andrews, of Captains for Clean Water. Dr. Bill Mitsch, a wetland ecologist and professor at Florida Gulf Coast University, is on a mission to find out if Lake Okeechobbee releases are supercharging red tide conditions. “This river is sending billions of gallons of Lake O water down stream,” Dr. Mitsch said. A team of researchers lead by Dr. Mitsch spent the day collecting water samples from the Caloosahatchee River as well as red tide along the coast. 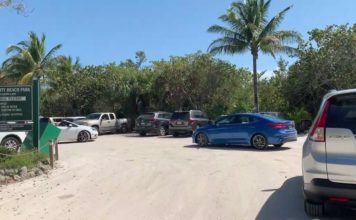 “We want to know if the nitrogen we believe is feeding the frenzy of red tide plus what We will call it red tide plus plus plus if that’s the nitrogen coming out of Lake O,” Dr. Mitsch said. If his theory is proven correct, Dr. Mitsch believes this will be the concrete evidence needed to finally push lawmakers to solve this puzzle: and that’s to add 100,000 acres of wetlands near Lake Okeechobee to act as a natural filter for the water discharges. “It’s an unfortunate circumstance where and we never thought this would happen this quickly and that’s why it’s imperative that we get the science quickly and move forward with known solutions immediately,” Andrews said. The water samples will be sent to the University of California, Davis, where the results will be determined in a few months. Previous articleHow does red tide affect pets?